Over the past couple of years, I’ve really developed a taste for sweet curry powder. Just opening the cap of the jar and taking a quick whiff of this spice mix makes my mouth water as the smell brings back the flavor of one of my favorite summer dishes, this curried couscous. What’s so great about this mix is that it works so well with all different types of food from poultry and seafood to vegetables and grains, and while it isn’t a hot or spicy curry powder, it’s one that definitely provides a great punch of flavor. When combined with a little cinnamon and ground ginger, spoonful of sweet curry powder really sets off this whole butternut squash soup. It’s a recipe I first made last fall and I’m so happy that Josie chose it for her Project Pastry Queen choice this week because I was looking forward to making it again and sharing it with you this time. I made the full recipe as it was written but without the cayenne and I cut back on the curry powder by 1/2 tbsp and the cinnamon by 1/4 tsp, both of which were just a touch too strong the first time around. This is a simple and filling soup to throw together for a weekend lunch, like what we made it for yesterday, or a reasonably quick weeknight dinner. 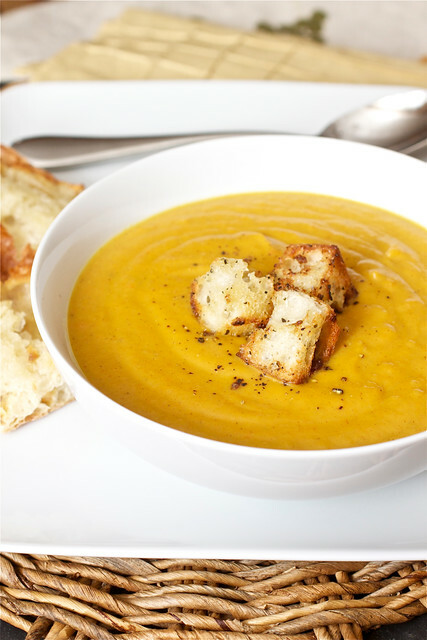 Either way, if you enjoy a little depth to your butternut squash soup, you’ll love this recipe! Hop on over to Pink Parsley for the recipe and be sure to check back next week for my choice (I love following Josie’s great choices!) – Bourbon Pumpkin Tart! This is exactly what I need right now… seriously good eats. I was just thinking that this year I wanted to make something with butternut squash and then I found this! It looks so thick and creamy! Perfect for fall! Ooo, a fellow curry powder lover. it is one of my favorite ingredients to work with. Like you, the smell alone is amazing to me. 🙂 This soup looks like a great way to use it! What awesome flavors! This must be delicious!